Building codes and design guidelines, e.g. FEMA (NEHRP recommended seismic provisions for new buildings and other structures, FEMA P-1050, Washington, 2015) and ASCE (Minimum design loads for buildings and other structures ASCE/SEI 7-10/2010, Reston, 2010), describe the problem of multi-degree-of-freedom systems with soil-structure interaction (SSI). These systems are modeled like those having a fundamental degree of freedom on a foundation with lateral and rotational interactions and the other vibration modes isolated and supported on a fixed foundation. This model oversimplifies the problem, neglecting the effects of having all modes coupled in the foundation with SSI. A simple, easily programmable, SSI model in which all vibration modes are coupled an attached to an infinitely rigid shallow foundation subjected to soil excitation is introduced here. Initially, the total response of the coupled system is calculated. Then, using traditional procedures to combine modal responses, a simplified alternative methodology to find the total response of this coupled system is proposed. The new methodology is verified against a robust numerical technique, i.e. boundary elements method, using a wide variety of cases that combine several types of soils, building heights and two structural typologies: bending frames and shear walls. 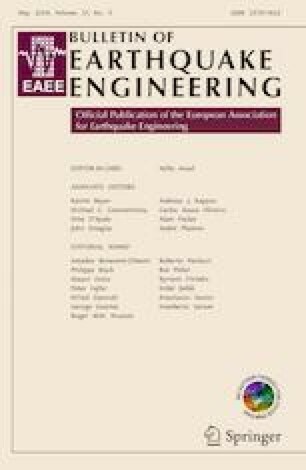 Finally, it is clear from the parametric study that current methodologies, based only on the interaction of the fundamental mode of vibration of the structure, in some cases has a significant influence on the total base shear of buildings, particularly in tall buildings founded in soft soils.